Watch the 9News special report. Colorado will receive far fewer refugees this year, according to the state’s Office of Economic Security. In January, President Donald Trump capped the number of refugees who may resettle in the U.S. in fiscal year 2017 at 50,000. That’s less than half of the 110,000 ceiling set by the Obama administration. Generally, Colorado accepts 2 percent of the national total of incoming refugees. So far this year, 271 refugees have resettled in the state, according to the Refugee Processing Center at the U.S. Department of State. This cutback will have a lasting impact on Colorado refugees and their families, says Kit Taintor, the State Refugee Coordinator. “We will see families that had hoped and been promised to reunite here not reunited because that number has been drastically reduced,” she said. A refugee is a person who has been forced to flee their home country. Refugees must prove they cannot return to their country for fear of violence or persecution. They must apply for a green card one year after arrival. Immigrants choose to leave their homeland and resettle elsewhere. Those who enter or reside in the U.S. without proper documentation are subject to deportation. Since 1980, nearly 58,000 refugees from more than 115 countries have resettled in Colorado. Currently, the largest populations of refugees include those from Burma, Iraq and Afghanistan. The state also resettles many from East and Central Africa. Where do refugees resettle in Colorado? Refugees resettle mainly in the Denver metropolitan area and, in smaller numbers, in Greeley and Colorado Springs. Who resettles refugees in Colorado? There are three major resettling organizations in the state: Lutheran Family Services, the African Community Center and the International Rescue Committee. How are refugees vetted and screened? Refugees must undergo an extensive vetting process which includes medical exams, multiple security checks and a cultural orientation. On average, the screening process takes 18 to 24 months. Once refugees are resettled in the state, they can receive up to five years of integration and social services, including employment assistance and citizenship classes. See the U.S. Citizenship and Immigration Services and process here. In Baghdad, Iraq in the early 2000s, Yasser Hussein, his wife, and his four small children would often sleep in one room together, for safety, as bombs exploded around their city. “My kids – they cry all the time,” remembered Hussein, who would sometimes seek out his own private moments in the corner of his backyard to let out a nervous scream. The temperatures during the summers were so high in his house with no electricity, he said, that they would also sometimes sleep on the roof. Hussein said they would surround themselves by white flags so hovering helicopters would know they were not fighters but rather an innocent family, trying to get some rest. Hussein’s son, Ahmad Karim, 21, said he remembered wondering if would die in Iraq as a young child. Hussein said two of his brothers were murdered and a third brother disappeared during the chaotic aftermath of the war. When he received a letter containing a death threat, his father encouraged him to flee immediately with his family. He took his family to Syria with only twenty dollars in his pocket. Eventually, the family of six landed in Lebanon, where they stayed at a refugee camp. They endured several rounds of background checks, fingerprinting, biometric scans, and vetting by international and American security agencies before being admitted into the United States as refugees in 2009. The entire family learned English and became US citizens when they settled in Aurora, Colorado. Hussein and his wife Huda Sheet went to work. She now works as an assistant teacher at a Montessori school, and he owns a restaurant hood and carpet cleaning business. Together, they had one more child who is now five. The eldest children are attending college. In February, they purchased and moved into a new home. Instead of shoes, Gatwec Dengpathot said he wore cow-skins on his feet as he hiked from Sudan to Ethiopia in the late 1990s, in search of a better life. Dengpathot, who was barely a teenager at the time, fled with his family during Sudan’s second civil war because there was not enough food in his village and his family lived in constant fear of being struck by bombs. “I used to say back then that I’m living to die tomorrow,” he said as he recalled hiding under trees in the jungle to avoid being detected by adversarial aircraft. During his two-month trek from what is now considered Akobo County, Jonglei State, South Sudan, he said he led smaller children through rivers and swamps infested with wild animals and poisonous snakes and witnessed friends and family members die of starvation and disease related to the famine. “Some days I would go for two or three days without eating only to drink water from the river, which is still not clean water,” he said. After two months of walking, his family finally arrived in Ethiopia, where he said they stayed in a refugee camp for about five years. The process of applying for refugee status and being accepted into the United States took nearly three. He remembers the day he learned he would have an opportunity to start a new life in Denver. “It was the most beautiful thing in my life because we have waited for so long,” he said. 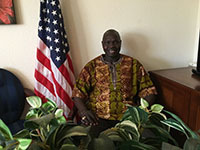 After arriving in 2001, Dengpathot graduated from high school and college in Colorado and eventually became a United States citizen. He now works as a Colorado State Patrol security guard at the state capitol. One day, he hopes to work in politics and perhaps become a state senator or the president of South Sudan. In the kitchen at chef Aung Kyaw’s Englewood restaurant, fresh ingredients sizzle in a pan, while he whips up a delectable pumpkin curry. Each week, he visits the grocery store multiple times to find the best vegetables and meat to create the unique, mouth-watering menu at his restaurant, Aung’s Bangkok Café. 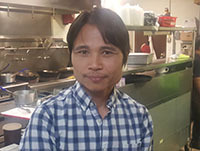 The place opened on the corner of Hampden and Downing Street in Englewood, CO in 2015, about a decade after Kyaw arrived in the United States for the first time as a refugee from his home country, Burma (also known as Myanmar). Kyaw, who said his father died when he was only eight, left his home in 1992, when he was 15 years old. 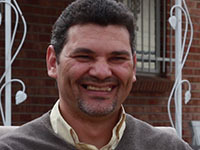 He was the eldest of five children, desperately searching for a way to support his family. Kyaw said he had been paid to help insurgents fight against the Burmese Army in Karen, a tribal area where he lived. He said families lived in fear of having food taken away from them or having their land burned. He fled to a refugee camp along the border of Thailand and Burma and stayed there for a short time before seeking work in Bangkok. There, he said he was introduced to professional 5-star chef, who taught him the art of Thai cuisine. When he applied for refugee status, Kyaw said he waited approximately three years before learning he would be accepted into the United States, selected to resettle in the Denver area. He attended the Emily Griffith School in an effort to learn English and started his first job at a Thai restaurant in Littleton. Now, with the support of Michele and Pat Mangan, volunteers who worked with the African Community Center to help Kyaw resettle in Denver, Kyaw has many dreams for his Thai restaurant. One day, he may introduce Burmese cuisine to the menu. The Alkekhai family lives in a cramped Aurora apartment. Abdul Alkekhai and his wife Fatima work long hours cleaning hotel rooms, to support their family and begin to fulfill their American dream. They have come from war-torn Syria where, five years ago, Abdul decided it was simply too dangerous for his family to stay. Abdul and his family fled to Jordan where the family, including their married daughter, her husband and two small children, spent four years in a refugee camp. There they were vetted multiple times by both international groups and the U.S. government to receive refugee status. But while the Alkekhais and their three younger children were allowed to come to the U.S., their married daughter and her family were not immediately authorized. Then came President Trump’s travel ban. The Alkekhais keep in contact with their family in Jordan through Facetime on their cell phone, contacting them to see their grandchildren. Their son-in-law, Ahmed, speaking from the camp, says he is near despair. And Ahmed says he believes the world is now immune to the suffering of millions of families like his: separated and isolated. Despite the challenges and the hardships, and starting their lives over again, the Alkekhais are thankful they are safe in the United States, and if they could, they would return to their home in Syria.